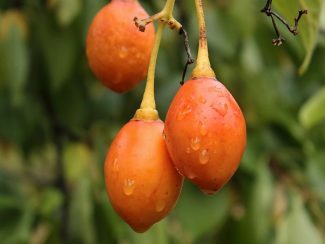 Ecuadorean Orange Tamarillo – Rare Fruit Society of South Australia Inc.
“Ecuadorean Orange” Tamarillo ripening in the Adelaide Hills region. Tamarillo Cyphomandra betacea, also known as Tree Tomato, is part of the Solanaceae family that includes, among many others, tomatoes and capsicums. Tamarillo is a fast growing small tree that bears heavy crops of red, orange or yellow fruit. The fruit can be eaten fresh or cooked in ways that tomatoes would be cooked.